Marth Stewart I am not. I’m a clutterbug with messy closets. That’s good news for you if you happen to be a clutter bug like me. You can follow right along as I’m inspired by Oprah and Peter Walsh to organize my life. The closet is in my guest bathroom on our main level which I’m pretty sure gets opened occaisionally by a curious visitor. For some odd reason it’s the bathroom of choice for my daughter and I to dry and style our hair. I even keep my tooth brush in there to use before I run out the door. 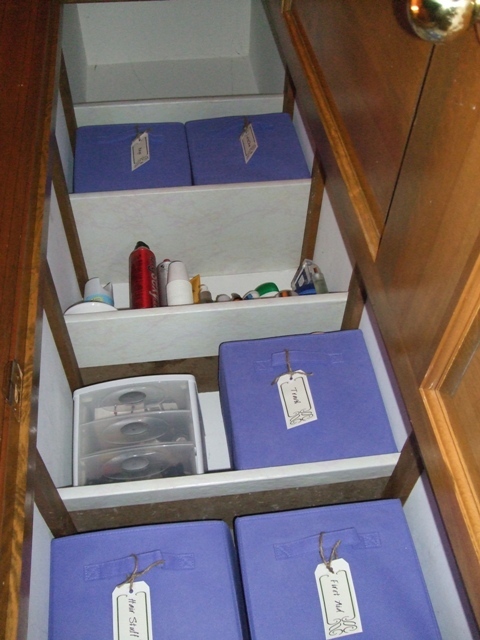 Additionally, here that I store items for visiting guests, first aid components and other miscelaneous things. 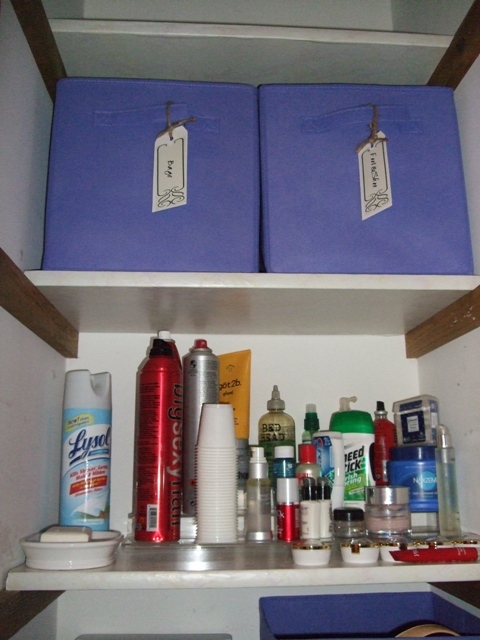 It’s near our kitchen and is the central storage area for shared items in our home. I wanted it to be finished in about three hours. If it wasn’t done, I knew it would linger on and that drives me crazy. 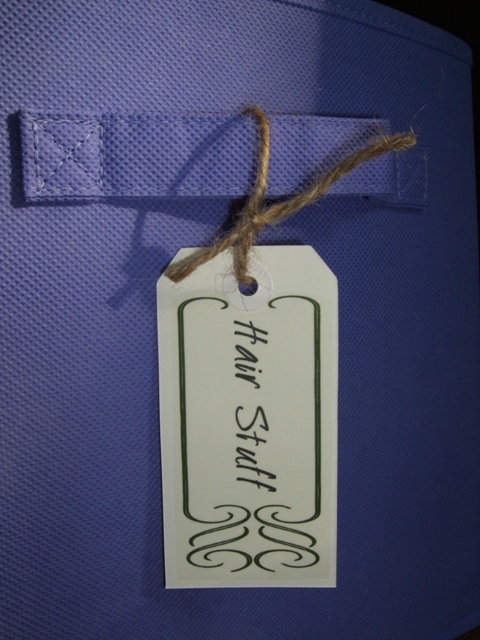 There had to be a specific place for certain items such as hair items, first aid, etc. It had to look nice. I think clutter free zones should be pretty – pretty makes me happy. So let’s get to it – here’s what I did…. I forced myself to throw away anything I haven’t used in 6 months to a year. It was hard to do that , so I went back through my save pile several times to make myself get rid of more. I couldn’t stand to look at the wood shelves, so I covered them all for less than $5.oo with good old cream and gold contact paper. Ideally, I would have painted the closet, supports and shelving, but it meant that the project would have taken a few days and I wanted it DONE! 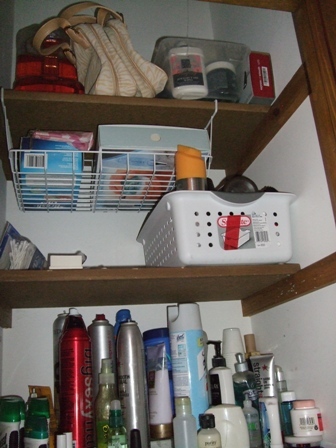 The existing acrylic stair step shelf organizer was used to hold items that get used often such as hair spray, soap, tooth paste, etc. 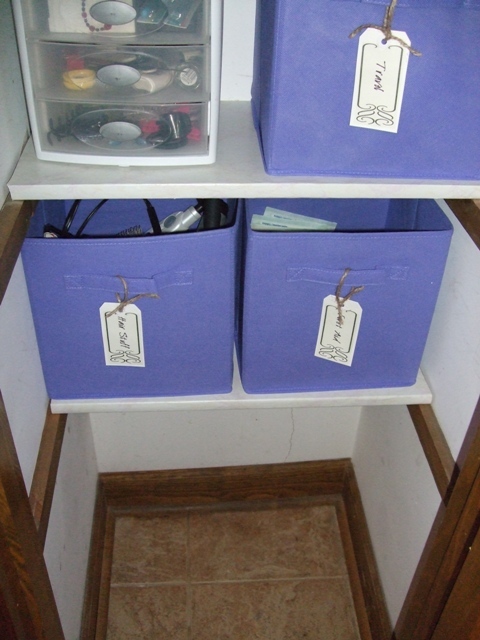 Items that could be grouped into categories went inside fabric bins that I got on sale at Meijers for $5.99 ea. I chose a dusty plum, but they are also available in lime green, red, hot pink and navy. 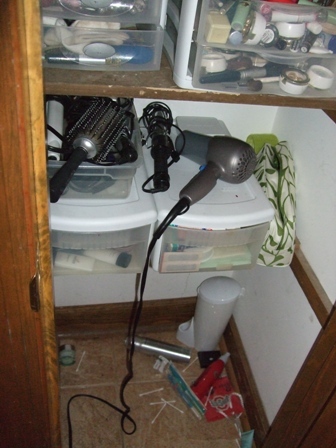 Loose items such as combs, hair clips, etc.went into the small plastic 3 drawer unit that I already owned. Once it was complete, I added the labels which I think are totally adorable 🙂 I’ll give instructions for those in my next post. Photos above are of the top three shelves. I left the very top one empty, because I can’t reach it and didn’t want to put junk up there. Bottom to top view of newly organized closet! 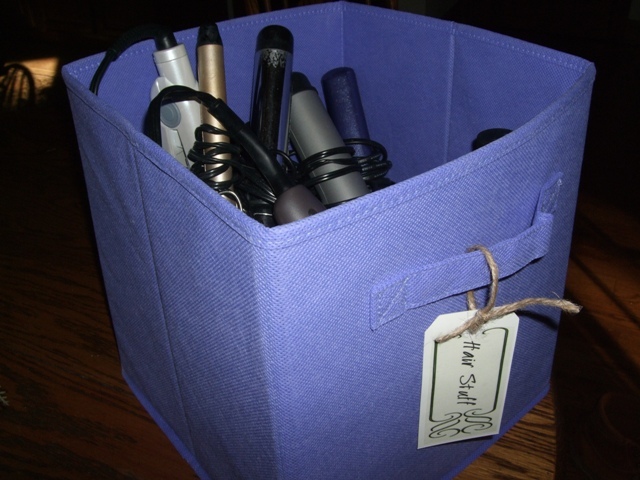 Above is one of the bins…I used it to store hair stuff such as the blow dryer, curling irons, hair straighter, and a brush. So what do you think? Up next I’ll have directions for the labels and a template so you can create your own! Also, just made the valance for the Kuster’s kitchen…I’ll have pictures for that soon! 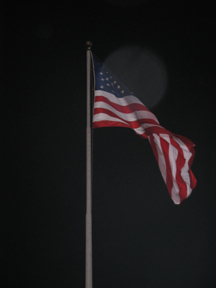 Thank you to the men and woman who have and are serving our country. Men and woman whom ultimately ensure that we have privileges we so often take for granted. Thank You.